Kiwi Media Group has released the prove shots and hand written greeting messages of its artists for the new year on the 1st of the month. “Hope your year will be happy and healthy.”, said Kim Hyungseok producer, the leader of Kiwi Media Group. His look staring the camera and smiling with the message and the signature on sketch pad attracts attentions. The trending rookie girl group GWSN who made their debut through their first album ‘THE PARK IN THE NIGHT part one’ last September, also greeted for new year. 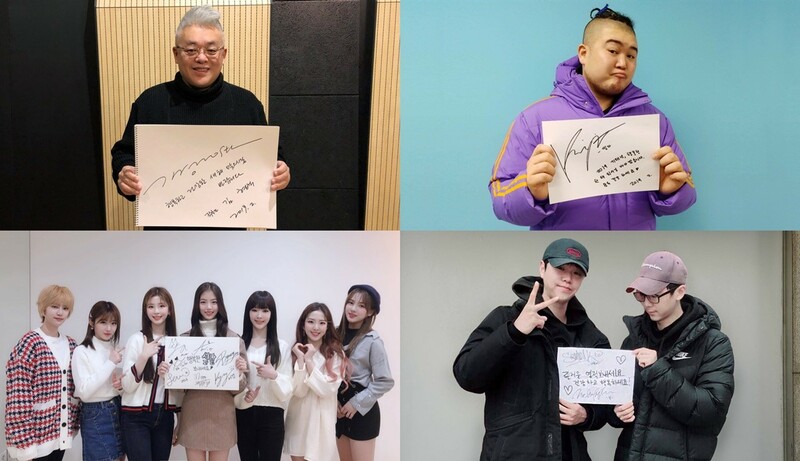 The seven members in the photo presented the sign with each of their personality with their hand written message “Be Happy Holidays”. Especially, the members grabbed the heart of fans by showing off their beauty. Rapper KILLAGRAMZ and the modern pop duo NICK&SAMMY also delivered new year message as “2019 Year of the Pig, Wish for the happy year. Be Healthy always”, “Happy holidays. Be healthy and happy”. “Our artists will be all coming to you with music and other activities so please expect and support us a lot”, said Kiwi Media Group.